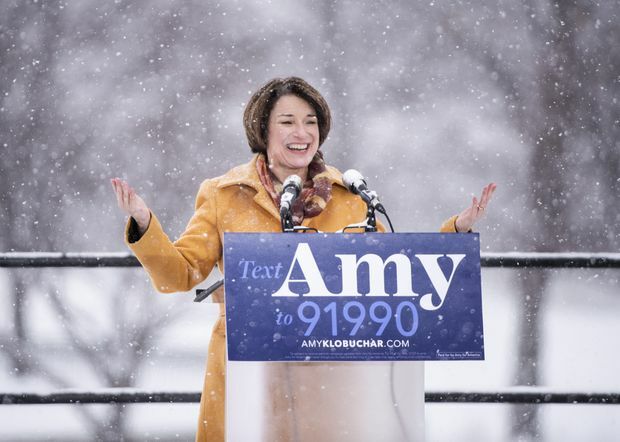 Sen. Amy Klobuchar announces her presidential bid in front of a crowd gathered at Boom Island Park on Feb. 10, 2019, in Minneapolis, Minn.
Klobuchar, who has prided herself for achieving results through bipartisan co-operation, did not utter Trump’s name during her kickoff speech. But she did bemoan the conduct of “foreign policy by tweet” and said Americans must “stop the fear-mongering and stop the hate. … We all live in the same country of shared dreams.” And she said that on first day as president, she would have the U.S. rejoin an international climate agreement that Trump has withdrawn from. The list of Democrats already in the race features several better-known senators with the ability to raise huge amounts of money – Elizabeth Warren of Massachusetts, Kamala Harris of California, Cory Booker of New Jersey and Kirsten Gillibrand of New York. “We worked across the aisle to get the federal funding and we rebuilt that I-35W bridge – in just over a year. That’s community. That’s a shared story. That’s ordinary people doing extraordinary things,” she said.